Hire a private jet and take your pick from some of Germany’s best and most festive Christmas markets. 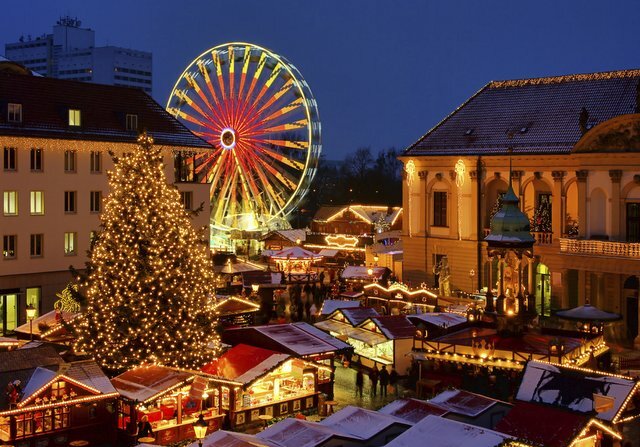 Every year Berlin comes alive with over a sixty different Christmas markets. Charter a jet to Schoenefeld or Tegel airports and spend a weekend exploring this fascinating city. The main Weihnnachtsmarkt is beneath the Gedächtniskirche, the Memorial Church. As well as culinary delights from a host of top chefs there is entertainment in the form of jugglers, acrobats, fire artists and musicians. For the more adventurous, on the other side of the city, is the Potsdammer Platz market featuring Europe’s largest mobile toboggan run. Perhaps one of the most well known cities for Christmas Markets, and attracting over two million visitors annually, is Cologne. With the imposing UNESCO World Heritage Cathedral as it’s backdrop the main market has over 160 stalls. Enjoy watching the local artisans at work, sample some of the local produce or drink a mug or two of Glühwein. The Koln-Bonn airport has a brand new GA terminal to handle private jets. The Dresden Weihnnachtsmarkt is the oldest in Germany with accounts dating back to 1434. This historic old city, set on the banks of the River Elbe, turns into a winter wonderland for four weeks every December. The highlight of the market is the Stollen Festival where a giant stollen cake is paraded through the streets, ceremoniouslty cut and distributed to the crowd. A short flight to Dresden airport provides easy access.